This exercise begins with a demonstration of fluid flow through porous sediment using a constant head permeameter, with the students conducting the experiment and collecting the data. The demo is followed by a Think-Pair-Share exercise in which the question is posed to the class: "What could we change in order to increase flow through the system?" The class then works through their brainstormed list of ideas, discussing each and evaluating whether it is correct or a misconception. 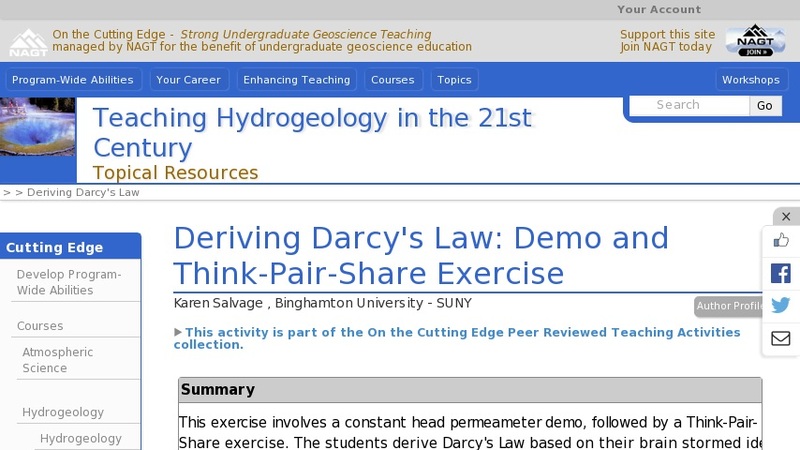 The students derive Darcy's Law qualitatively, based upon the results of the Think-Pair-Share exercise and discussions.